Healthy dissent keeps a democracy thriving. Citizens of a democratic country must be given the right to express their opinions even if they don’t favour the ruling dispensation. Democracy is sustained by dissent and the right to protest. In fact when laws are unjust, Mahatma Gandhi stated that protest and disobedience becomes an obligation. But of late it is this space of dissent in India which is shrinking fast. The northeastern region has a legacy of strong socio-political movements against those in power. Leaving aside the secessionist movements, the states have also witnessed long drawn socio-political movements like the Assam Movement. While the crackdown was then also, of late the Hobbesian states of the region have taken newer authoritarian forms. The Citizenship (Amendment) Bill, 2016, proposed by the BJP government, has seen unprecedented camaraderie amongst all the states. This proposed Bill will make six religious minorities from Pakistan, Afghanistan and Bangladesh the eligibility to apply for Indian citizenship. The reason quoted is these minorities like the Sikh, Christians, Jains, Parsis, Buddhists and Hindus face religious persecution in these countries and India should provide them refuge. A large number of organisations have also come together against this ‘unconstitutional’ Bill. While the outright dismissal of these protests have been the way the government chose, of late, even protests have become difficult. Crackdown on protestors is not something specific to the present government. Even the earlier Congress government was notorious for such antics whereby police force would attack unarmed protestors. But what has changed during the current government is the outright dismissal of such democratic rights. Assam Chief Minister Sarbananda Sonowal, Finance Minister Himanta Biswa Sarma and other BJP leaders had to face people’s ire in different parts of the state. They were welcomed with black flags and slogans. People in many places have boycotted their meetings. But interestingly while the CM did not respond in a very authoritarian manner, Himanta Biswa Sarma took a very vindictive stand. He went to the extent of getting protestors arrested and beaten up by the police. 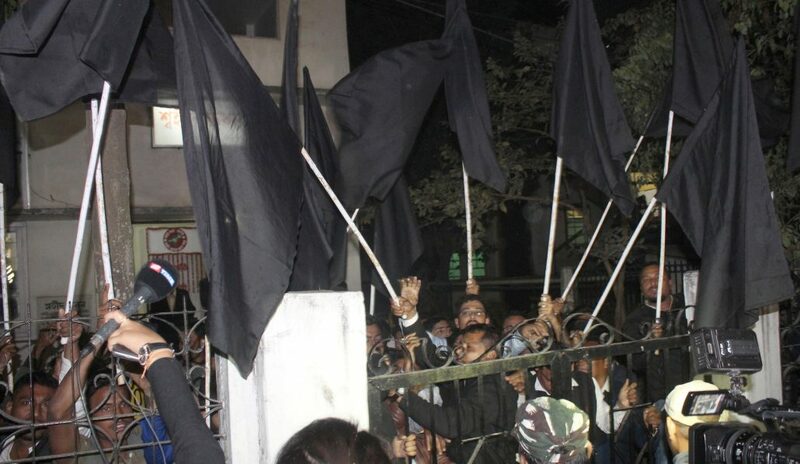 Nalbari unit of All Assam Students’ Union waved black flags at Himanta Biswa Sarma on January 27. They also waved black flag at Chandra Mohan Patowary and Pijush Hazarika. The ministers were on their way to lay the foundation stone of Nalbari Medical College. This protest was followed by a clash between AASU protestors and BJP supporters. Questions have been raised about the role of the police. Law and order is taken for a ride when members of the ruling party is involved. However this saw a crude reaction. BJP President of Tinsukia District Committee Lakhishwar Moral was attacked and beaten up by protestors. While all violence should be condemned, there is a need to understand why such incidents are taking place. When space for peaceful protests shrink and peaceful protests go unnoticed then violent outbursts become frequent. The state government has been dealing with the protests in a very undemocratic manner. While on the one hand, Dr Hiren Gohain and others are regularly targeted for speaking up against the government’s anti-people policies, the police went a step ahead and taking suo moto action registered cases of sedition against these people. These extreme cases show the authoritarian attitude of the government. Dr Himanta Biswa Sarma took the incidents one notch higher. He painstakingly collected the names of those who showed him black flags at Rangiya and tried to give the entire incident a communal colour. But when he started facing similar protests in different places, he was forced to realise that people across communities are rejecting their divisive policies. It seems after that the ruling regime was seized by a phobia of black flags. And in many meetings of the Chief Minister people wearing black was not allowed to enter!! This absurd approach of the state reached its extreme when the video of a woman taking off the black jacket of her three year old child became viral. The woman has gone to attend the CM’s meeting at Bihali. And the guards asked her to take off the child’s black jacket. When people all across started reacting then the woman changed her stand in a mysterious way. Later it came out that some people asked her to change her statement. More the government tried to stifle protest, more the people are spilling to the roads against such authoritarian attitude. The Prime Minister visited Assam on February 8 and he also had to face the ire of the people. His convoy was shown black flags at different places by members of AASU, KMSS and AJYCP. 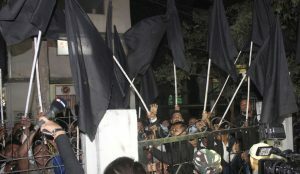 When his convoy passed through Gauhati University, the students welcomed him with black flags. 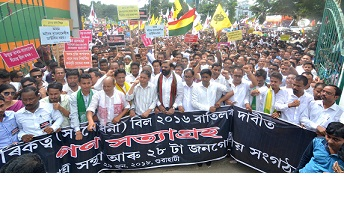 On 9th, the Tai Ahom Yuva Parishad, Asom (TAYPA) called for a 12-hour bandh which found support from other groups. This crackdown on dissent is neither specific to Assam nor did it start with the present regime. But post-2014 it has taken an extreme form. The earliest crackdowns were on students’ protestors from Hyderabad Central University to FTII, from JNU to TISS. Students putting forth genuine demands – be it against sexual harassment of women in BHU or regular fellowships, they met repression. In Assam also, quoting technicalities like lack of permission to stage protests, protestors have been brutalised. Police officials have even opened fire at unarmed protestors in many instances. Technicalities have at times drowned crucial issues which the protestors tried to raise. In neighbouring state of Manipur, a journalist has been arrested for raising crucial questions. Similarly, in Tripura, tribal leaders like INPT general secretary Jagadish Debbarma, IPFT leader Aghore Debbarma and activist Anthony Debbarma have been slapped with sedition charges for opposing the Citizenship (Amendment) Bill, 2016. What is happening today is a continuation of such an authoritarian attitude. When people all across the State are protesting against the Citizenship (Amendment) Bill, when even government officials, students have come out in the streets against the Bill, the response of the government has been disappointing. The government has categorically denied to acknowledge the grievances and the PM also reiterated that the proposed Bill would not impact the region. This crackdown on protests shows the lack of conviction on the part of the government. There is a tendency to categorically label protestors as being Congress supporters or members of specific groups. And this is used to justify stifling dissent. Peaceful demonstrations work as safety valves in a democracy. The government’s continued dismissal of the grievances and the crackdown on protestors will push the state towards further chaos.